Bridgetown is the capital and commercial center of Barbados. It is also the island’s only city. In 2014 more than 110,000 people called Bridgetown home. It is the cultural, political, and economic heart of this Caribbean island nation of 284,664 (2013). Founded by the British in 1628, its old town section and nearby St. Ann’s Garrison are examples of well-preserved colonial architecture. St. Ann’s Garrison, more commonly known as “The Garrison,” is a small district situated about two miles from the heart of Bridgetown, but officially recognized as part of the city. The capital city is also home to the Bridgetown Port, one of the most advanced ports in the Caribbean. Bridgetown was originally named “Indian Bridge” for a crude bridge, built by the Garifuna, an indigenous people. The bridge spanned a river in the main section of the city (now known as the Careenage). When the British settlers landed on Barbados, there was not much infrastructure, save for the old bridge. The British settlers called the area Indian Bridge. In 1872, the original bridge was replaced. The town was later called the “Town of St. Michael” in official documents, before finally being named Bridgetown. As one of the earliest established towns with a fortified port in Britain’s Caribbean network of military and maritime-mercantile outposts, Bridgetown and The Garrison were the focus of British trade-based expansion in the Americas. By the 17th century, the town had become a trading post for goods, mostly sugar, and enslaved Africans who were distributed throughout the Americas. Bridgetown is the only city outside North America that was visited by America’s future “First Father,” George Washington. Bush Hill House, where he stayed, is now renovated and called George Washington House. It is a striking reminder of that significant visit. The city has a number of architectural landmarks including St. Michael’s Cathedral, constructed in 1789 after a hurricane destroyed the original wooden building dating from 1665, and the Nidhe Israel Synagogue which dating from 1654, is one of the oldest synagogues in the Western Hemisphere. The General Post Office, erected in 1833 after a hurricane destroyed the original building, is one the world’s oldest postal services. It was established in 1663 as a postal agency to handle overseas mail. St. Ann’s Garrison and its fortifications constitute the most complete complex of 18th and 19th century British garrisons in the Atlantic region. As an integrated semi-planned urban town, with a collection of colonial warehouses and dock facilities, it has remained essentially unchanged over the years, and provides an intriguing glimpse into an important period of British imperial rule and culture. The city is the seat of Parliament and also has a campus of the regional University of the West Indies. The Grantley Adams International Airport is located 16 kilometers (9.9 miles) southeast of Bridgetown, and has daily flights to major cities in the United Kingdom, United States, Canada and the Caribbean. 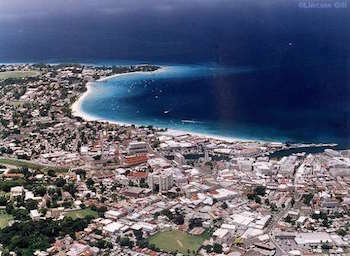 "Bridgetown," World Encyclopedia, http://www.encyclopedia.com/topic/Bridgetown.aspx; www.barbadospocketguide.com/our-island-barbados/bridgetown.html; http://www.barbados.org/garrison.htm.